Future Pro USA is a guide for students looking to migrate from United Kingdom to the United States of America for university studies with sports scholarships. And because the ideal candidates are selected through tests of their athletic skills, the organisation has to keep them informed on the ongoing assessment dates. The web developers at Credence brainstormed upon the features to be included on the new website. The look and feel of the website had to be based on sports culture. It was meant to have dynamic attributes too. After preparing the blueprint our team decided to go with Advanced CI Framework. The actual process was more invigorating than it seemed. To create a website that could pull users without shouting for attention, we used carefully shortlisted navigation features. 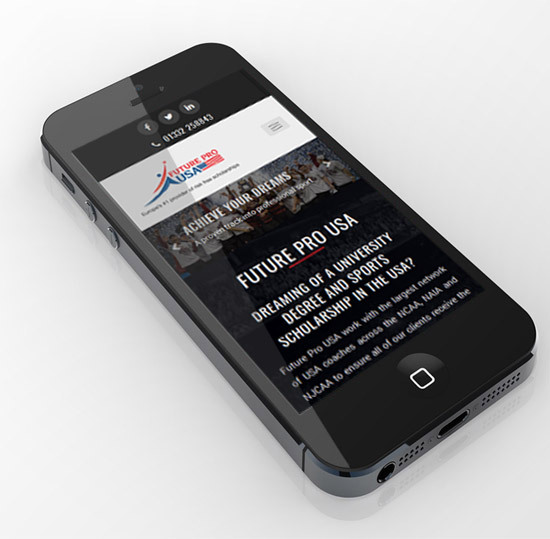 Mobile friendliness was ensured through responsive web design. For content management system to be used by the brand owners, we offered bespoke internal CRM & Candidate Management Tool. The end result was a platform that visitors could effortlessly sail through to know what’s critical for them to apply for that coveted scholarship. Future Pro USA is a group that helps aspiring students from the UK pursue university studies in the top colleges of the United States along with the advantage of sports scholarship.